Last May the Oxford University World Literature Society held a seminar devoted to the poetry of the Lebanese poet Jawdat Haydar (1905-2006) as a “Call for Tolerance and Cohesion”. The interest of Oxford University in Haydar’s poetry follows on seminars held in no less distinguished institutions, such as the Library of Congress in Washington and the Library of Alexandria, where Ahmed Abdel Moaty Hegazi and Hassan Teleb, among other luminous speakers, discussed the universality of Haydar’s poetry and his poetic vision. Needless to say, in Lebanon he is a celebrated poet known as the "Shakespeare of the Arabs". His poems are included in school curricula, inscribed on a tablet at the Baalbek temple, the subject of academic events at all the major universities, and sung by famous singers. 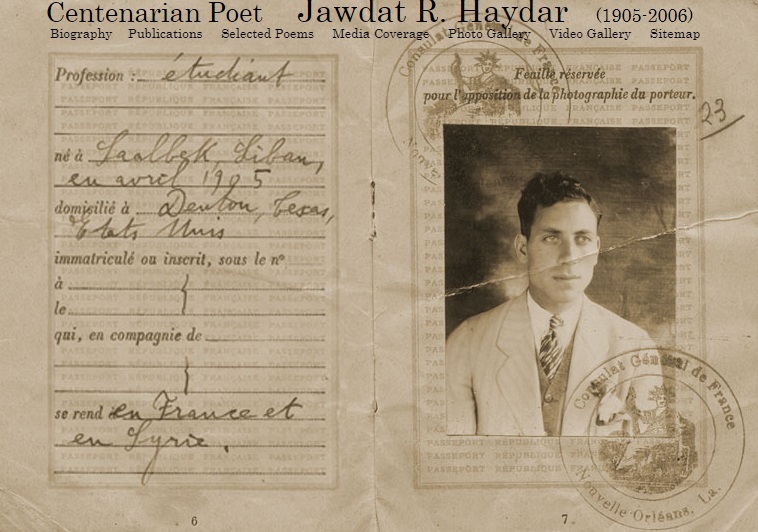 The journey that led Haydar’s poetry to Oxford started almost a hundred years ago. The Haydars were known for their fierce patriotism, and his father and brother were exiled to Anatolia by the Ottomans while he stayed behind in Baalbek with his mother. When she died in 1915, he travelled alone, a penniless nine-year-old child, to join his family in exile. At a young age, he experienced the stings of loss, partings, displacement and occupation. None of these turned into xenophobia or hatred of the other. His early sufferings, as well as those he encountered as an older man – the French mandate, the civil war in Lebanon, the deaths of his wife, son and brother, and all that was happening in the Arab world - molded what would become his philosophy of peace and universal love. On his return from exile, he fell in love with the English language when he heard it spoken by British soldiers in Baalbek. He took lessons in it, and then joined the American University in Beirut. From there he went to Texas where he came into contact with all that was admirable about American life: the warmth of the people, college life, and most importantly, its values of liberty and democracy. Though he was to have his own career, holding important posts in the Iraq Petroleum Company, poetry – written mainly in English - was the medium through which he expressed his meditations on life, and he always managed to create time for it despite his demanding work and large family. While it was not his main concern to publish his poetry and achieve fame, his voice eventually reached America, where the Vantage Press published selections of his poems in Shadows in 1988. Other anthologies followed: Echoes and Voices by World Publishing House in Beirut, and 101 Poems by Vantage Press again. The range of his subject matter is astonishing, but the overall message never changed. The turbulence in the Middle East led him to uphold freedom and democracy, and to denounce the injustice of the war-mongering Super Powers. Yet he never lost sight of the essential topic: Man. He could rail at Uncle Sam, but call Texas “dear home” because of the warmth of Lee and Jack, his American friends. Initially acclaimed as the poet who called for East/West reconciliation, he is now increasingly being studied as the prophet for universal peace. Haydar explored the two aspects of human nature – the capacity for destruction and for good – and believed that man’s better side would win. It's time to becomepen'tent, it's your time. The God Jaydar refers to here is a universal God of peace and forgiveness, a God who, like Haydar'screed, transcends race, ethnicity, boundaries and limitations. The ability to forgive, to love all God's creatures equally, like Coleridge's Ancient Mariner, gives us inner peace. Forgiveness and peace go hand in hand. Fittingly, Haydar dedicates 101 Poems to “all peace lovers in the world”. The cohesion and tolerance that were the subject of the Oxford University seminar, and that form the philosophy of Haydar’s poetry, stem from within the person and with a ripple like effect spread out to touch open hearts wherever they may be. It is a salutary lesson to learn in a world torn by bigotry, hate and violence and we would do well to heed that call.